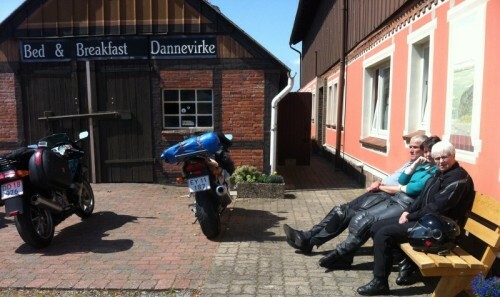 One of Denmarks best known motorcycle accomodations are "Bed & Breakfast Dannevirke" which are located in Germany. Many motorcyclists have during the last years where Carsten has been the owner, visiting the cozy B&B. Tourstart has also been there, and we had a great week-end togehter with many other motorcyclists. The rooms are all top class. Nice and clean - and you can also make a cup of tea or coffee. Our room had entrance to the terrace and the very cozy patio - which for sure is an extra plus to the room. After making a cup of coffee, we were ready to explore the area on our motorcycle. As a new service to the motorcyclists B&B Dannevirk offers now ten different motorcycle routes to ride - all free of charge. The mc rides can be downloaded to the gps and you can also get then in print format. Hereby everybody can get a good experience on the motorcycle. The ride of the day "Langs Kielerkanalen" and the speciallity about the ride is the ferry hanging in wires from a bridge. Note that it is free to cross the Kieler Canal, which you do more than ten times on this motorcycle tour. Each crossing of the Kieler Canal takes only a few minuts, so there are simply not time to pay, which might be the reason it is free of charge. The whole environment aroud the ferrie are relaxed and cozy. We met a lot of other motorcyclists - both Danes and of course also a lot of Germans - who went on this ride to enjoy the ferries and the small twisty motorcycle roads. It is recommended to make a stop at Sehestedt, where you can have a break on the "Imbiss" with a great view of the Kieler Canal, ferry and the ares. An ice cream or pommes frites are much tastier when the view is nice. However, just exactly as Carsten mentioned, the wire ferry was closed as normal in the school holiday, as it was being maintained. Still, we stopped at the ferry and admired the construction. The purpose of visiting B&B Dannevirke is to get some good experiences riding the motorcycle and have enjoyable hours with friends. So when the motorcycle tour is to be evaluated, the sun is shining and then it is a perfect mix to grab a cold beer and relax on the terrace. Carsten trust his guests, so anybody is welcome to take all beers they like in the fridge, and just inform Carsten about the consumption and pay when leaving the B&B. We enjoyed a quite beer before we head to Landhaus Hentschel for the dinner. Landhaus Hentschel is the local inn -1 min walk from B&B Dannevirke - where they have fair prices and the friendly people server you a wonderful "wienerschnitzel and weissbeer". There are a special atmosphere at B&B Dannevirke, as all guests speak to each other as we all share the same interest in the motorcycle. That we felt right after arriving, but also in the evening at the terrace. Here all guest sat all evening and enjoyed the weather and a refreshment - in a relaxed and friendly atmosphere. The weather was so mild that we did not go inside, as there are also a 1. floor with "Steen's Corner" and motorcycle parts to give the perfect atmosphere. That we must try at our next visit. Many motorcycle clubs has B&B Dannevirk as a goal for a week-end ride on the motorcycle, and Carsten Alstrup informs "B&B Dannevirke is a very popular place going for the Danish, Swedish and Norweigean motorcyclists, as we are only 50 km south of the Danish border. Further to this, we have many motorcycle clubs who have a club ride down here for a cozy week-end" and Carsten Alstrup continues "that is also the reaso why we have made the ten motorcycle rides starting at B&B Dannevirke, which fast became very popular amongst our guests as it never has been easier to go for a great motorcycle ride". It is easy to get a good a start on the day at B&B Dannevirke, as a large and healthy breakfast meets you. The breakfast is according to nutritionists the most important meal of the day, and that B&B Dannevirke takes serious, as you are served egg, bread, juice, youghurt, coffee etc. After the breakfast and check-out it was unfortunately time to say to Carsten and we all hope to see him and B&B Dannevirke soon again. Luckely, we had great weather and a nice motorcycle ride to the village of stork's, Friedrichsstade which is the German answer of Venice and up the coast to Denmark. The motorcycle tour is "Nordfriesland rundt" and we eneded the ride driving along the border on the German side to Flensburg before we with great thanks left Germany after a wonderful week-end with many good expereinces.